HOW is it November already? Seriously. Anyway, Cole has been talking about Halloween since mid-summer. After the past few years, he was *really* excited to go trick-or-treating, and to dress up. After Woody and Thomas, I’ve accidentally set the bar pretty high in the costume department, and Cole is pretty opposed to anything store bought. He wants something that not every other kid will be wearing, which I can definitely understand – and while he is still little and as long as my creativity holds out, I will do my best. He originally wanted to be a table, and I was SUPER excited about that because it sounded pretty easy to do, and then he wanted to be a volcano, which certainly would have been original, but might have been more difficult to implement, and THEN Daddy talked him into being a T-Rex *holding* a volcano instead – which sounded a lot harder (thanks, Adam), but I was gamely Pinteresting up some ideas when he landed on his final idea: witch. 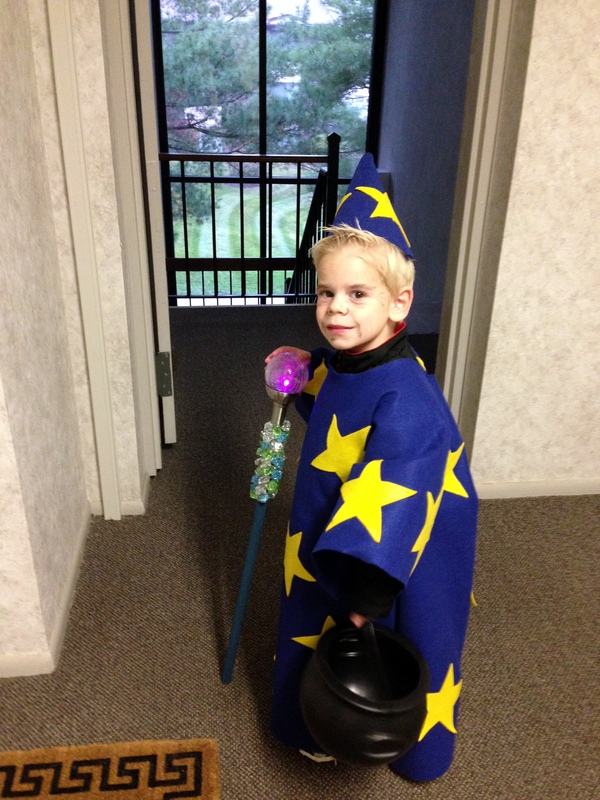 I also wasn’t sure if he was asking for a girl costume (which I would have been okay with – he’s FOUR), or if he was drawn to some other aspect of witch-dom. 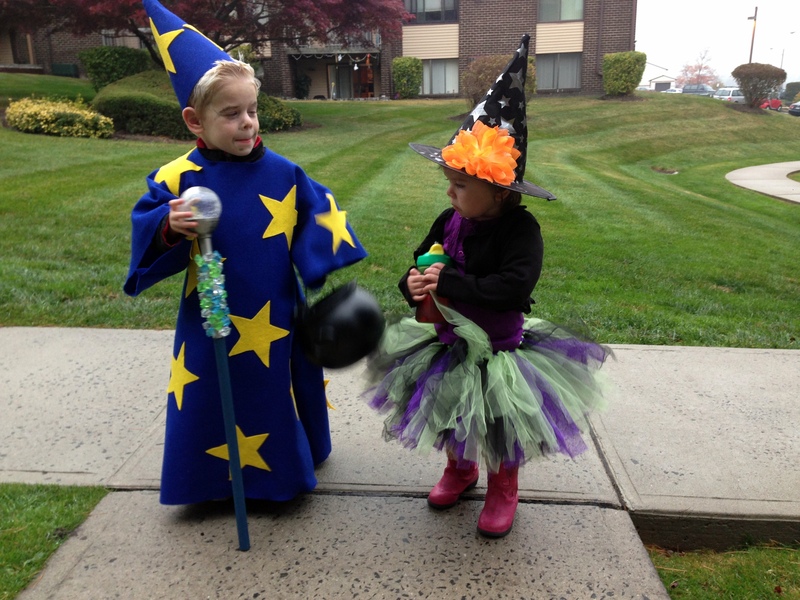 After a bunch of conversations, we established that he wanted to be a male witch – a wizard. Specifically, he wanted to be a “Big Daddy Wizard.” Okay. He was still less than helpful with any details about what a Big Daddy Wizard looks like, but I gave him options as we went along, and he was totally happy with the final result. He had face make up on because he wanted to look older and mean, but it made him look really weird when he smiled, so that’s why he looks strange here. Essentially his costume was a simple felt a-line dress/robe thing, that I based on the tutorials here and here. His hat was stiffened felt sewn into a triangle – I was worried about making it too big and accidentally went a touch too small – oops! It worked out for the most part, though, and didn’t really seem to bother him. Special thanks to Aunt Angela for manning the sewing machine! I cut the stars out of yellow felt and used spray adhesive to stick them on; hot glue might have been a better choice, but I didn’t really need his costume to last forever, so it was fine. I should point out that it was about this point in the process that Cole asked me what kind of magic spells he would be able to do. Apparently, he REALLY believes in my crafting ability. 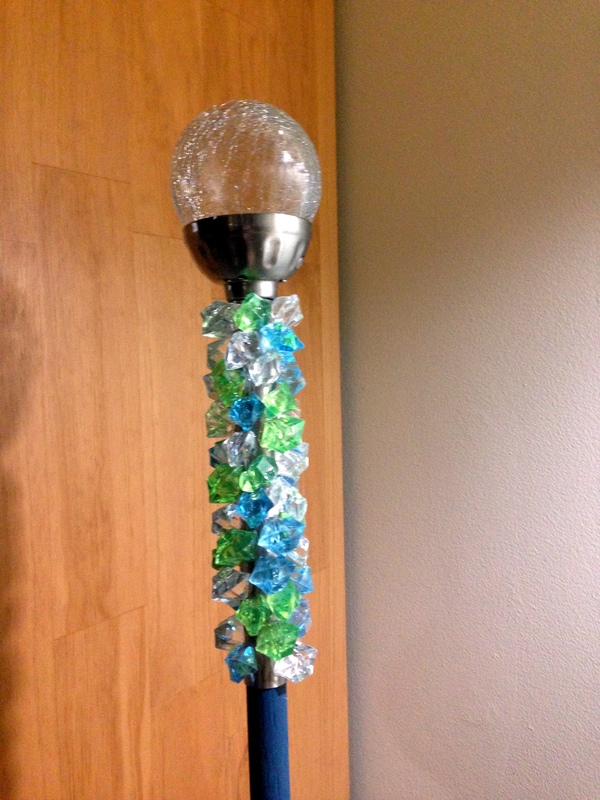 Anywho, I hot glued on some aquarium crystals (which Cole kept calling diamonds), and it was done. I feel kind of like a Mommy rock star here. She’s pretty easygoing, and fell in LOVE with the tutu I whipped up, so it was all good, though. I mainly used Suzanne’s tutu tutorial (tututorial? ), but I used 2 strips of tulle for each knot, and I attached them a little differently than she did; I took 2 strips of the same colored tulle and folded them together in half. Then I put the folded loop over the ribbon and pulled the ends through. Clear as mud? I didn’t take pics while I was doing it, and I’m too lazy to take some right now, so if you *really* need further clarification, let me know and I’ll get on that… I added a flower to a $1 witch hat, and voilà! 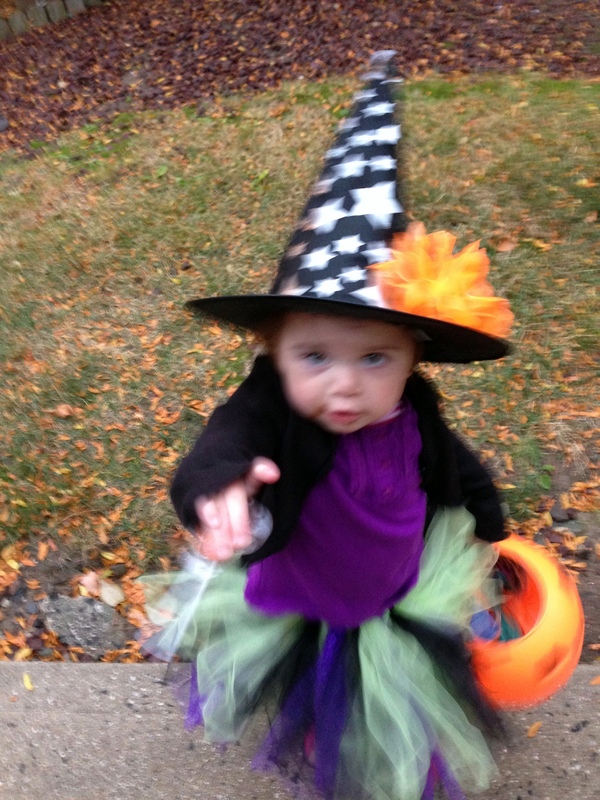 Baby Witch. Both kids did GREAT trick-or-treating! 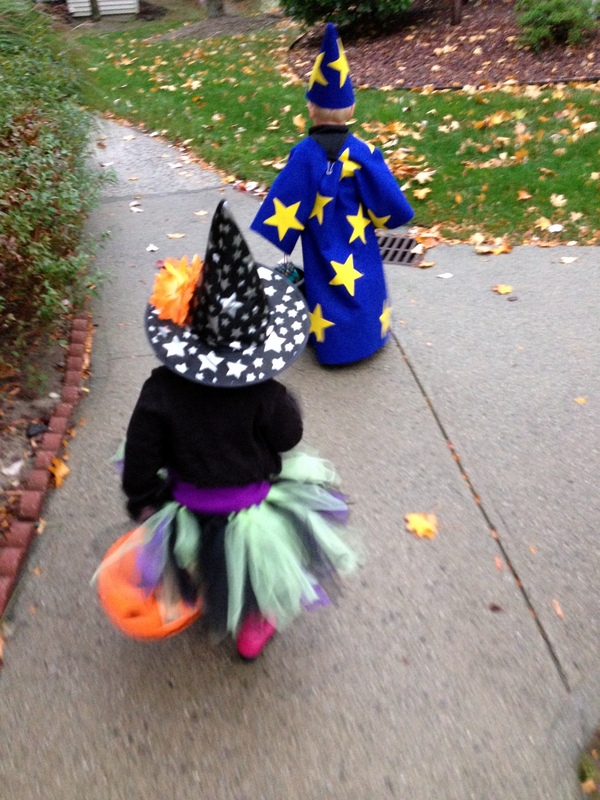 They walked on their own, said “Thank You” and “Happy Halloween,” and came home with quite the haul. Halloween: WIN. Those are so cute! I was a witch for a lot of years. It’s a classic.